It's time for another challenge at 'Tis The Season and we have a color combo this week. As a very traditional person who loves her red and greens this was a tough one for me and I had to really think about it. So what are the colors? 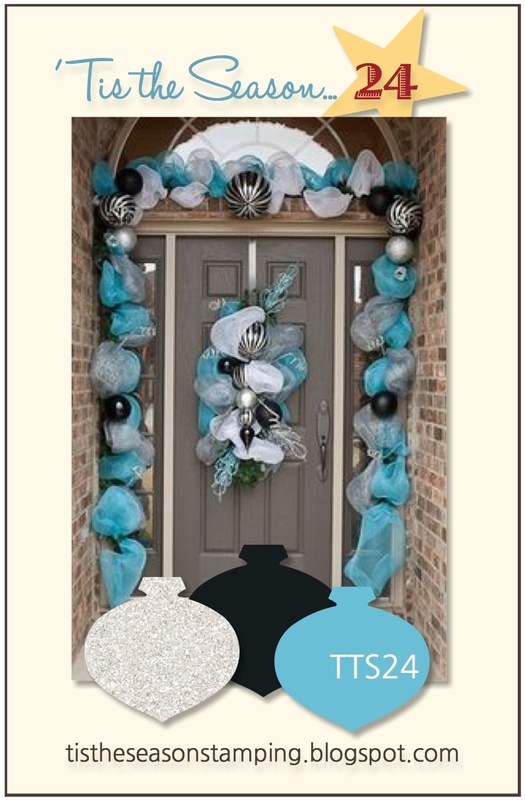 They are black, turquoise and silver! I grabbed one of the new sets that SU is releasing on Friday, it's called Wondrous Wreath. I stamped the first part in Bermuda Bay and then the second stamp, of berries, was stamped in Metallic Silver. I took the Silver Dazzling Details and put this on top of the stamped berries. The piece was set aside to dry and I worked on the rest of the card. The "joy" sentiment is part of the Wonderful Wreath Framelits that can be bought as a bundle with this wreath set. I cut it out in Silver glimmer paper and after my wreath dried I popped the sentiment up with dimensionals across the wreath. My card base is Basic Black and the 2 smaller panels are Basic Black embossed with the Pretty Print TIEF layered on Bermuda Bay. The wreath was then popped up on dimensionals on the embossed panel. It's a very simple card but packs a visual punch in person! 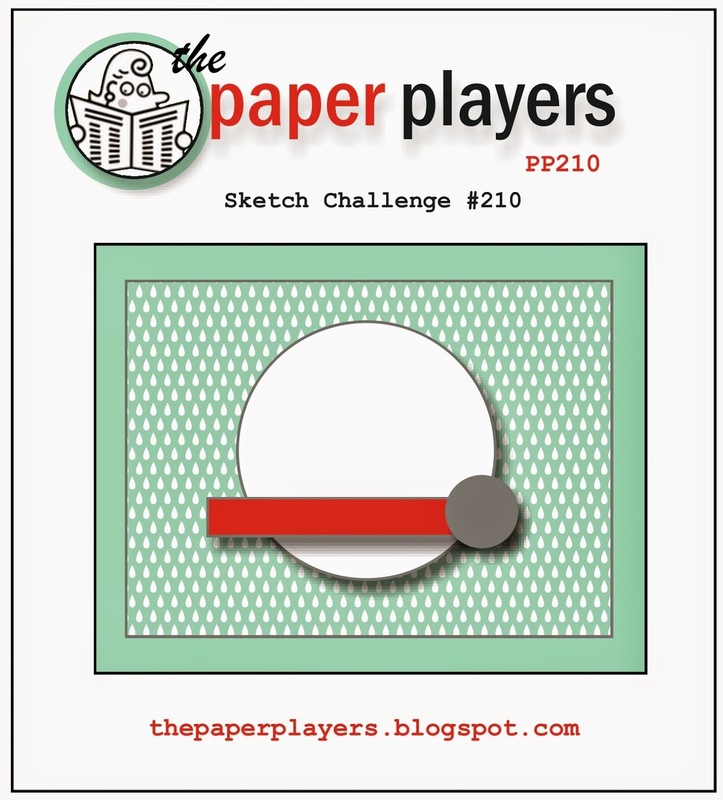 My layout came from the current challenge over at The Paper Players, which is a great sketch. I wanted to do something a little different with my wreath and this sketch was perfect for the thoughts swimming around in my head! Come by and check out how the rest of the DT team at 'Tis The Season used these colors, and also go by and check out The Paper Players and their great sketch! Hey, Lisa, this beautiful wreath works for Merry Monday this week too if you want to link it up! The blue and silver really pop with that elegant black background! Wow! What a spectacular card. Those colors are amazing. Great use of the sketch. Thanks for joining us at The Paper Players. I've been a bad blogger recently and haven't been to visit for ages. What a lot I've been missing obviously! This us one of the most gorgeous cards I've seen in a long time. So impressed with your skills! 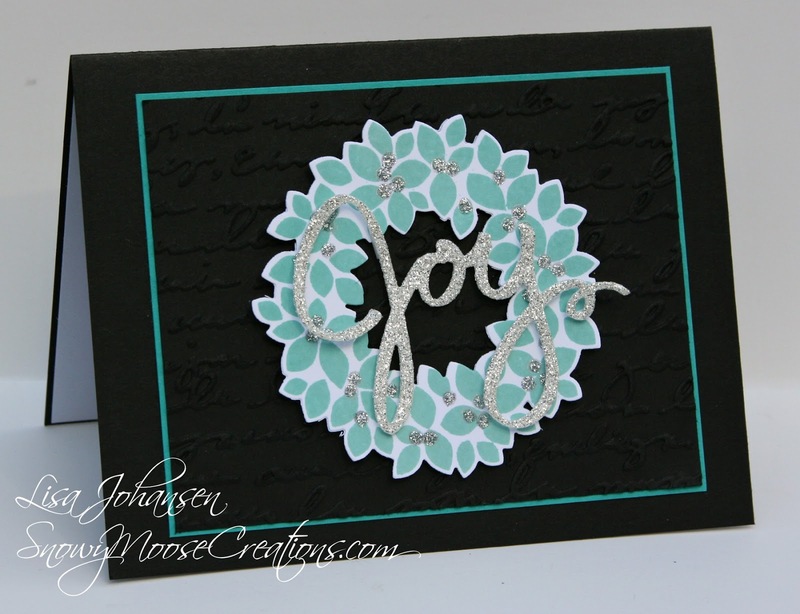 Love the colour combination you've used and the glittery 'joy' - gorgeous! Thanks for joining us over at The Paper Players this week!